Yes, it’s been too long since we’ve blogged! To our defense a bit, it’s been busy, busy. The guests have kept a nice flow going at Bella Rose. We got our youngest off to college (she’s a freshman at St. Bonaventure). And to celebrate our kids off on their next chapter with decent heads and hearts, we took our first long vacation without them. 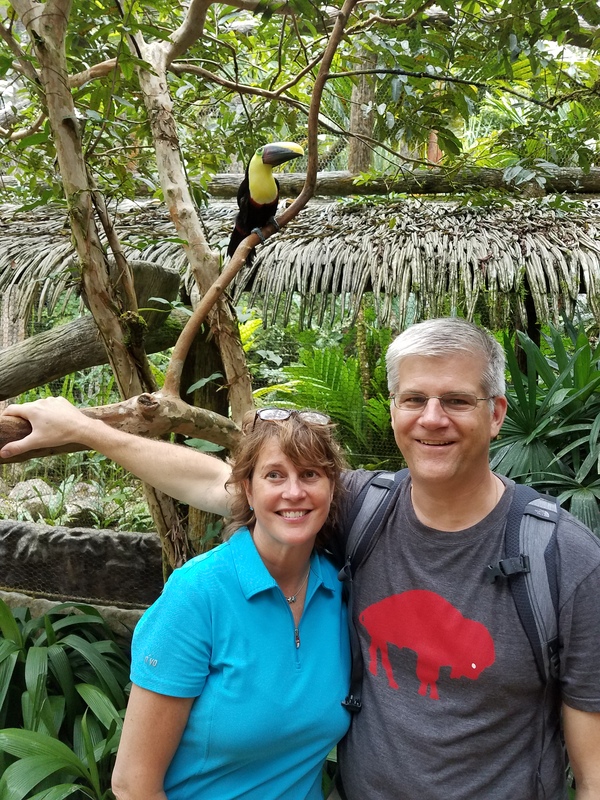 So the first day following the end of our 2017 busy season at Bella Rose, we were on a plane to Costa Rica – fun, fun, fun! The flora, fauna and animals were amazing. Even better was the welcoming, friendly and easygoing nature of the Costa Ricans. (We won’t delve too much into the road system, but please know the roads there are steep, can comprise only dirt, and often twist and turn with few guardrails; and, our car did catch on fire, but we knew ahead what to expect of the roads and purchased the proper car insurance upfront – Jill’s ultra conservative when there’s a possible risk, having practiced law for over 25 years before inn keeping). We cannot wait to go back! So after our adventure in Costa Rica was the holiday season. And you know how that goes. Plus the regional Finger Lakes’ newspaper asked us to feature Bella Rose in their annual holiday edition, so Jill was even more meticulous than usual with holiday decorating. Then came January with Jill’s dad celebrating a special birthday in Florida, so how could we avoid the Sunshine State in January with the bucolic weather we’ve been having in Upstate New York?? The most comfortable linens – the sheets are new, soft and smooth even though heavyweight and were unanimously selected from five samples by our youngest and her highly selective (trying not to say “picky” here) girlfriends. New down pillows, a soft and firm one for each of you. Cozy fireplaces and jetted tubs in two of our three guestrooms for soaking and just overall relaxation. Continually updated and maintained guest rooms and common areas (what would we do in our less busy season?). Trendy, three course gourmet breakfasts (again, Jill would be bored in our less busy season if she wasn’t testing new recipes). More things to do every year! Of course, most wineries and breweries are open year round. But there’s many more winter festivals and activities. And a number of museums are open year round now. Sonnenberg rejuvenated its Dickens Festival this past year. Rob and I continue to find new trails and waterfalls even though we’ve hiked and explored around here over 20 years. Paddle boarding, kayaking, biking, cross country skiing and the arts continue to become more and more popular in our region. CMAC continues to host great musical artists. Tom Petty put on a great show last year (may he rest in peace), in addition to The Who, Luke Bryan, Dave Matthews, The Avett Brothers, Santana, Sam Hunt and more.